I am not sure if anyone else feels like this, but 2018 is flying by and the holidays are right around the corner. I planned on curating a holiday guide for all you health and wellness lovers, but then I discovered the ultimate gift that includes health, wellness, beauty and fashion in one festive package - that gift is the winter FabFitFun box. FabFitFun is a seasonal subscription box that is filled with 8-10 full-sized, premium products valued at over $200. Each season you are able to choose products and add-ons you want in the box or be surprised. There are two subscription options, you can either pay $49.99 each season you want a box or you can purchase the annual plan which will give you 4 boxes a year for $179.99 (a $20.00 savings!). Also included in your subscription is access to member only sales and FABFITFUNTV - which gives you access to work out videos on demand. The is only my second time receiving one of the boxes, but I can tell you already that I am obsessed. If you are looking for the perfect gift for a woman in your life this is it. The first thing I love about this box is the packaging. It always matches the season and serves as a reminder that you are going to love what is inside. The next thing I love is that you receive full size items not samples. 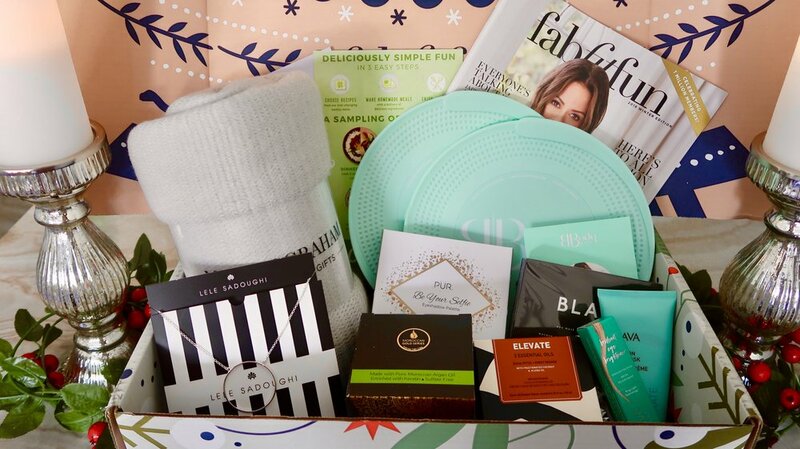 Each box comes with FabFitFun’s seasonal magazine in addition to the items you selected for your box. The total value of this box is $318.00. With a value this high and a low selling price this makes for the perfect Christmas gift. Each box usually retails for $49.99 but for my readers I have a special deal. Follow this link and use code SANTABABY to save $10.00 off of your first box bringing the price down to $39.99 - but hurry these boxes sell out every season.